weekcap - Work on stuff that matters. Work on things that matter by reflecting on the past and being thoughtful about your future. How often do you catch yourself wasting time scrolling through Facebook, Twitter, or LinkedIn? How often do you find yourself working on things that don't actually matter in the grand scheme of things? How often do you finish your week and think, "what did I even accomplish this week?" It's tough to stay focused in an age of distractions. You may have already seen these stats, but did you know that the average person spends over an hour per day on Facebook? Did you know that a Netflix subscriber spends over an hour and a half every day watching movies/tv? I love Stranger Things on Netflix too, but these distractions are programming your brain to focus on short-term hits of dopamine, and it's preventing you from achieving your goals and being more productive. So how do you stay focused and hit your career goals? There's a lot of tools and tricks to try. There's a variety of steps people take to be more productive. You may start using a to-do app, or purchase a paper journal and start writing as a way to focus and eliminate distractions. I tried all these things and had mixed results. I started using a to-do app and quickly forgot about it. I carried my paper journal around and would keep forgetting to write in it (or I'd forget to bring it with me). Meanwhile, I spent more and more time scanning social media and checking my email. Then I found something that worked! In early 2013, I heard about this super simple product called Ohlife. Once per week, I'd get an email asking "how did your week go?" and you could quickly respond over email. In addition, I could see things I wrote in the past. It was like a digital journal, but I'd get a nudge over email to fill it out. I lived in my email inbox, so this integrated perfectly into my daily workflow. 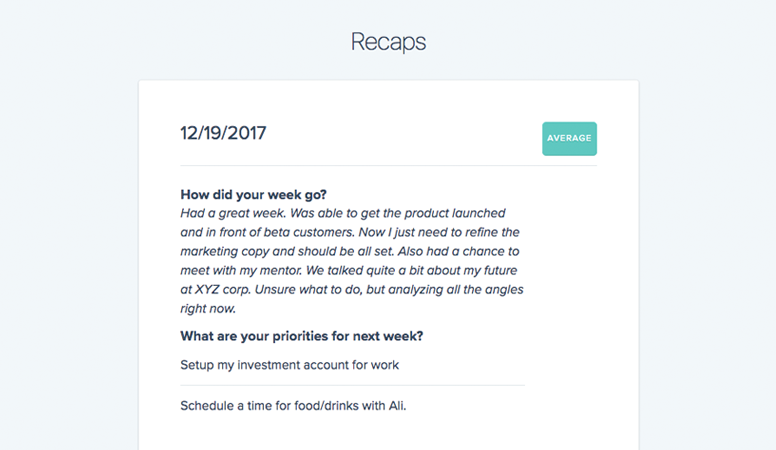 For nearly two years, every single week I'd recap my week and talk about what I hoped to accomplish in the week ahead. At first I thought Ohlife would be too simple, but it was so simple it worked. I loved how simple the tool was, but I wished I could ask myself questions like, "what are you priorities for next week?" or "what did you read this week?". Then it would be a service to recap my life, but also plan and grow in my career. In September of 2014, I received an email from Ohlife that didn't look like the rest. I was super bummed about it. Ohlife was a free service, and I never saw them charge for a premium plan. The service was so valuable to me that I would have paid for it. I thought I might be the only person who thought this, but I was wrong. A lot of people wanted the service to continue. One tech CEO was even willing to pay $1000/mo for hosting costs to keep the service running (he had been using it for six years). For a few months, I tried building a manual solution with a Google form and calendar reminders, but I quickly gave up. It just wasn't the same. I decided I'd try other productivity tools, but nothing was as simple (and effective) as Ohlife. I was looking for something that would help me build a regular habit. Every year, (especially around this time of year), people set goals and spend quite a bit of time working on New Year's resolutions. For some people, fitness is a priority. For others, it's career advancement (and maybe a raise). It's highly likely that the goal you want to achieve only happens when you create a habit. Habits take time to form. So what do you do? You need create a habit. If you're like me, you need to be nudged (or encouraged) along the way. That's why I loved using Ohlife. I didn't have to think about using it. It automatically showed up every single in my email inbox. It wasn't another app I had to use on my phone, it was integrated into my workflow. It's been nearly three years since Ohlife shut down, but up until a couple months ago, I would keep thinking about how I wanted something to help me remember my day (or week), and also provide a bit of structure to help me hit my goals and grow as an individual. I'm always thinking about a hundred different things, so this would have to work automatically (or I wouldn't use it). 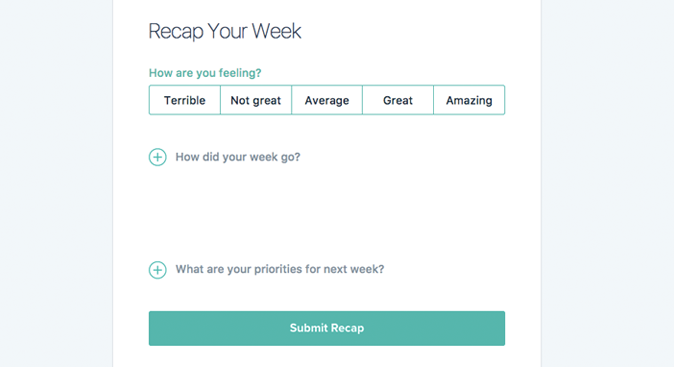 For the past couple years I've been building Friday Feedback (a team check-in tool for leaders also inspired by Ohlife) so I knew that a regular cadence of reflecting on your week was super valuable in a team setting. But I wanted something for myself. In short, I decided to build a better version of Ohlife. It would be super simple to use, but also help you stay on track and do meaningful work (and avoid distractions). I'm not going to pretend that weekcap can instantly make you more productive and awesome at life, but if you commit to trying it for a few weeks, I think you will quickly become hooked on it. What do you have to lose? If you have trouble being productive already, why not give weekcap a try? Even better, you can get started for free. There's no free trial length. A premium plan exists (to keep the service running and avoid shutting down) and includes the ability to ask your own questions, but for many, the free plan is all you need. If you're interested in learning a bit more about the product itself, scroll down a bit more. If you want to get started, you can create a free account right now. Check-in on a regular cadence over email. Recap how your day (or week) went and create goals for the future. Over time, recaps build a career journal, helping you reflect and grow. See graphs of how you have been feeling over time. Pick the questions you want to ask, when you want to recap, and more. Customize according to your needs and hit your goals faster. Did you know that people who reflect on the good things in their life once a week are more positive and motivated about their current situations and their futures? We make this easy for busy people. Weekcap automatically nudges you to help hit your goals and build a reoccuring habit. If you've wanted to start journaling, but always forget to write stuff, this is for you.